Confession: I do not sleep in pajamas, I sleep in a T-shirt. On a recent road trip to Reno, I discovered I forgot to pack my prized T-shirt. So, I went across the street to a half empty mall just as it was closing. I got inside the retail compound, victory! But the security guard on duty gave me the proverbial “sorry, we are closed” as he pulled the doors shut on me and I seethed. That line rankles me as much as, “It will be 45 minutes to an hour for a table”. That mall was just shutting down for the night, but retail stores across the country are closing their doors permanently, fast and furious, as e-commerce crushes them in a race they just cannot keep up with. As agitated, restless and impatient shoppers, we expect things to be speedier, more accessible and available all day and all night. E-commerce is 24 hours, 7 days a week. Who can compete with that? 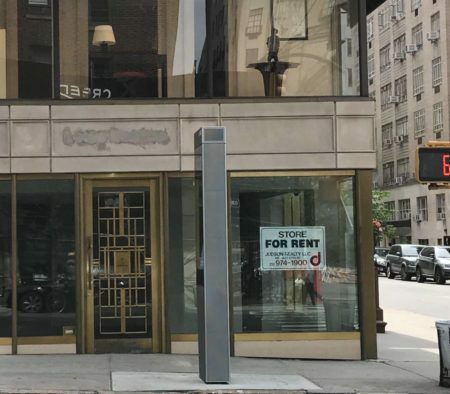 Recently, my wife Yaz and I were biking along the tony Madison Ave at 6:30 am on a Sunday morning and saw an empty shop with a “For Lease” sign at the 100 percent corner (a prime location) on the northeast corner of 68th and Madison. A prime retail spot up for lease in Midtown Manhattan. 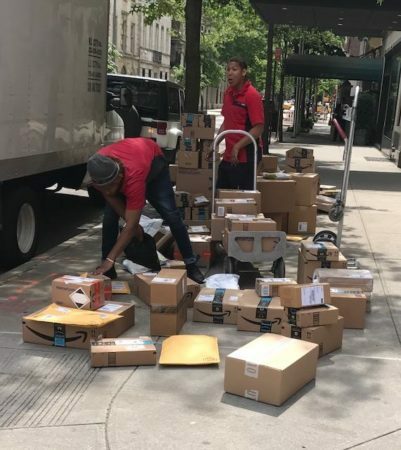 Directly across the street, a crew of four workers were emptying a truck and sorting through a mountain of Amazon boxes to be delivered on a Sunday. Madison Ave shops are notorious for being closed on the Lord’s Day. Workers unload many Amazon boxes for delivery on Sunday. Retailers and their landlords took things for granted for too long. We were always waiting impatiently for their doors to open and race to get there before they closed. Their schedules were not about us but about them. Residential real estate suffers from the same industry-first, consumer-second problem, though not for much longer. 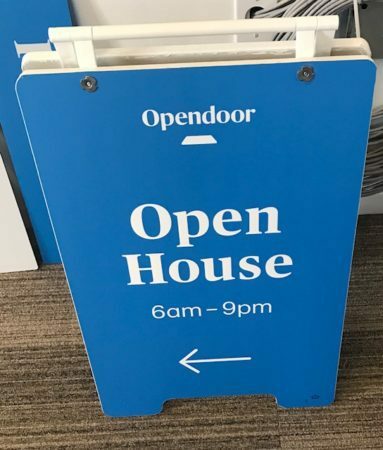 Consider the Opendoor open house sign. Yes, you read that right 6 a.m. to 9 p.m., seven days a week. An open house sign for an Opendoor listing. Consider the classic Open House, 2 p.m. to 4 p.m. Sunday. Really? Don’t be too quick to judge the Opendoor on-demand strategy. Retailers said “impossible” to the idea of same day e-commerce deliveries, minimized the importance of free shipping and touted “touching and feeling” the product. Yaz likes to scan the Redfin app (the best in the biz) all times of day and night. Months ago, we were leaving a club and she was fiddling with the app. She asked, “why can’t we go see this house now?” She had figured out the house was empty by the pictures. Opendoor is experimenting with sensors, buyer authentication, agentless showings and other technologies to solve the problem of the cramped showing schedule and the protracted closing process. Bugs, yes, but for the most part, it is working. You can imagine the day when the houses with more showing hours and easier access will sell faster than homes done the old way. The parallel to e-commerce is unmistakable. You ask about occupied houses? My bet, once sellers learn homes will sell faster, they will think about things differently. E-commerce changed behavior as will new and exciting ways of selling houses. It will start with empty homes, spread to all houses, and will be one piece of of the new real estate marketplace that will trump tradition. Nothing is more important than authentication of buyers which will make agents safer, but also give people the security they need to let people come and go to see their homes. The true early test of Uber took place in the the swanky Upper East Side of New York City where moms put their kids in cabs and town cars to get them to school. They would cross their fingers about the safety of their precious ones. Uber came along with its GPS tracking and mothers instantly adopted the new ridesharing service. That test is what set Uber on its course to revolutionize transportation.